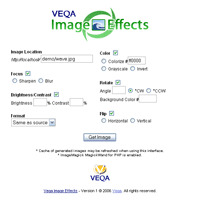 O Veqa Image Effects is a PHP tool to get Web image effects on the fly. Features: sharpen, blur, brightness, contrast, colorize, grayscale, invert, rotate, flip, and reformat. It supports JPG, GIF, PNG, and BMP formats and works with GD or ImageMagick.